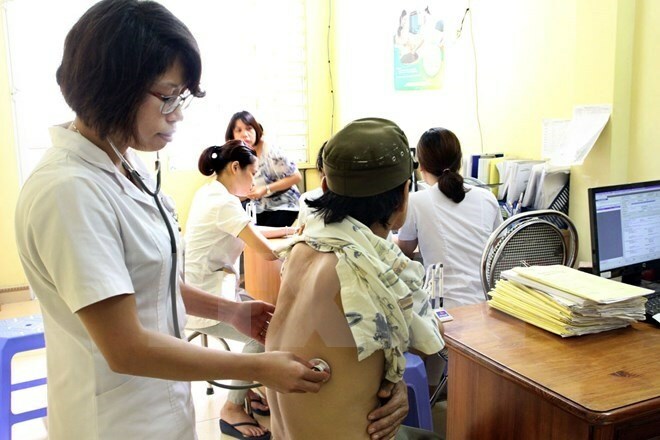 Hanoi (VNS/VNA) - Prime Minister Nguyen Xuan Phuc has urged the health sector to continue improving the quality of human resources and focusing on improving medical ethics, while enhancing the quality of the country’s population. The Prime Minister chaired a meeting of key cabinet members on August 9 to consider three development proposals from the Ministry of Health, Ministry of Home Affairs and Ministry of Planning and Investment, which will later be submitted to the Party Central Committee. Commenting on a proposal regarding the protection, care and improvement of people’s health and population, presented by the Ministry of Health, PM Phuc stressed the need to learn from the progress and achievements made in the region and the world so as to catch up with advanced technology and services. “The Government is responsible for taking care of people’s health and this is a consistent view,” PM Phuc said, adding that it was necessary to boost resources for the sector. "We, with current human resources, can attract foreign patients to Vietnam for healthcare. But on the contrary, we spend a lot of money going abroad for medical treatment,” he noted and emphasised the need for mechanisms to build modern medical centres that can meet international standards. The PM also noted issues such as health programmes for the poor and other vulnerable groups, the roadmap for market-based health services and the creation of a competitive business investment environment for the health sector. “Ensuring the satisfaction of patients is an important measure of service quality, and hospital rankings should take this into account,” he said. With regard to population problems, the PM said that the project should provide solutions for issues such as increased life expectancy but poor health after retirement, the rapidly aging population and the quality and structure of the population. PM Phuc asked the health ministry to prioritise measures that improve the quality of the population, saying that the size of the population must be in line with the country’s sustainable development goals. For the Ministry of Home Affairs’s proposal regarding renewal of management mechanisms, financial mechanisms and the reorganisation of the system of public service delivery units, the Prime Minister stressed the fundamental spirit of financial self-reliance, staff reduction and self-management in accordance with the socialist orientation. Emphasising the spirit of rearranging nearly 60,000 public service units, PM Phuc asked the sector to thoroughly work on the remaining issues. He agreed with the proposal’s concept of autonomy based on the level of self-funding and suggested that solutions must be strong enough to revolutionise the current limitations. The Prime Minister emphasised maintaining only essential services for the Government. “It is necessary to expand autonomy, having the best mechanisms and policies in place to promote socialisation and minimise State budget spending,” he said, asking the Ministry of Home Affairs to take on specific tasks and actions, especially solutions regarding financial mechanisms and improving the quality of public servants. PM Phuc also reviewed the Ministry of Planning and Investment’s proposal about the establishment of a specialised agency to act as the State’s representative in State-owned and State-invested enterprises. He asked the ministry to follow resolutions of the Party Central Committee such as Resolution 05-NQ/TW on reforming the growth model, enhancing the competitiveness of the economy and separating the functions of asset owners, capital and State management functions.